I loved meeting sweet Cameron at my studio last week for her newborn session! She is the baby sister of a little girl who I have photographed since she was a brand newborn. I love watching families grow and getting to meet each new member as a newborn to capture this special stage. Here is one of my favorite portraits of Cameron who gave me great eye contact during the photo shoot! 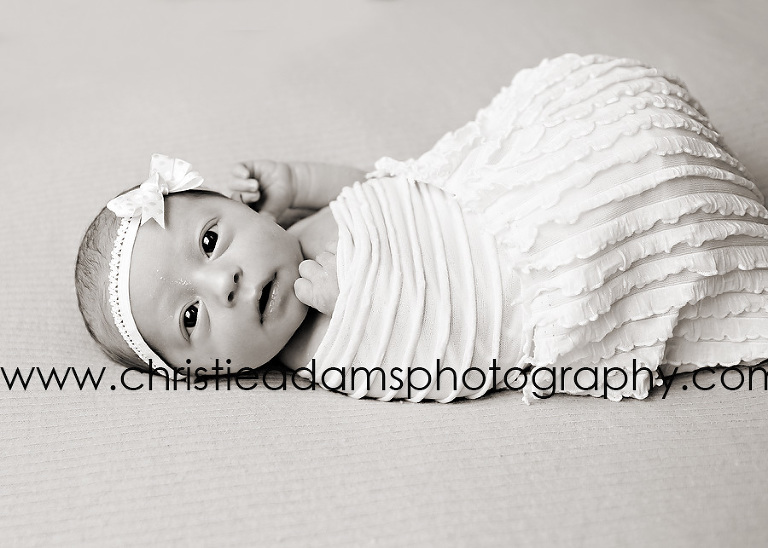 Christie Adams Photography has been a newborn photographer in New Jersey since 2007. Over the past 11+ years Christie has photographed over 550 babies and specializes in timeless and classic portraits. This means that minimal props are used. Instead the focus is always on your baby and not a backdrop or set or prop which will quickly date your photos. With minimal props your images will stand the test of time and look just as beautiful on display in your home decades from now as they do today. The studio is currently booking winter newborn sessions.